Brewing in rural areas was an important local industry in the days before safe drinking water was readily available to everyone. The water used to produce beer and ale is heated, so making it safe to drink. When cheap tea became widely available in the 19th century, the boiled water used to make it made tea a safe beverage to drink as it killed water-borne diseases like dysentery, cholera, and typhoid. Some scholars suggest that the drinking of tea made for a healthy workforce that help drive the Industrial Revolution of the 18th and 19th centuries. Three main ingredients are needed to brew beer: hops, malted barley and water, all readily available within the old parish of Nonington. The mansion houses, larger farm houses and the licensed victuallers would all have had their own brew houses. Ratling Court, still has a very fine example of a brew house. Ale houses such as the White Horse in Church Street brewed their own ale and beer virtually on a daily basis until the eighteenth century when it became more common for brewers to supply ale and beer to ale houses within a six or seven mile radius. Before the advent of canals and, later, the railways, poor roads meant journeys of more than seven miles or so resulted in ruined beer due to the rough treatment it received. Brewers also began to buy or lease ale-houses so that they could increase their market for beer in a certain area. Larger villages around Nonington such as: Ash, Bridge, Eastry, Littlebourne and Wingham all had thriving breweries, those at Ash and Eastry lasting into the 20th century.Gardner’s Ash supplied the ‘Royal Oak’ in Holt Street until the 1950’s. In 1790 the White Horse was leased for twenty-one years by William Hammond of White Friars,Canterbury to William Baldock, brewer, of Canterbury and John Rigden, brewer, of Faversham. Rigden’s later becoming one of the main East Kent brewers, amalgamating with George Beer and Co. to become George Beer and Rigden’s. From the time of their initial introduction from the Low Countries in the late 15th century hops needed to be properly dried for use in brewing beer. Early oast kilns were converted barns and the earliest surviving purpose built oast in Kent dates to around 1750. The early purpose built oasts had square towers, which were easier to construct, but around 1840 hop growers decided that round kilns would be more efficient, believing they would be more efficient at a better heat distribution, with no cold corners. Round towers became the norm and many surviving oasts have round kilns, or roundels. However, about 1890 science proved square kilns to be more efficient, as well as being cheaper to build, and post 1890’s oasts are nearly all square. Oasts have a distinctive conical roof designed to create a good through draft to ensure a good airflow through the kiln to make the fire draw properly and thoroughly dry the hops. There are cowls at the peak of the cones with finger like wind vane to rotate the cowl to ensure it always has its back to the prevailing wind. Early kilns were charcoal fired but improvements in transport, such as the railway, in the 19th century meant that coal or coke was readily and cheaply available. Coal and coke were in turn by gas and oil fuelled heaters. Prior to the advent of easily regulated gas and oil heaters keeping the drying fires burning at the correct temperature required great skill and specialist firemen called “Oasties” were employed during the harvest. As the brewing of beer became more industrialised in the 19th demand for hops soared, hops became the third most important crop grown in Nonington until the 1880’s. The 1859 tithe map shows and oast house in Ratling and lists the owner as William Oxenden Hammond of St. Alban’s Court but the oast appears to have gone out of use in the 1860’s. When the St. Alban’s estate was dispersed in the 1930’s the building, by then a dwelling, was sold off and later demolished. Another Hammond oast house is recorded on the 1839 tithe map behind Church Farm house but the 1859 map does not list a working oast but refers only to Old Oast Hill. 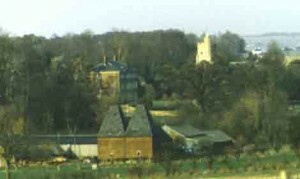 Hop gardens were to be found on Oast Field to the rear of Park Farm at Frogham where an oast house, which still stands, was recorded in the parish tax records until about 1860 when it appears to have still been in use as an oast by Mr. Ratcliffe, the tenant farmer. A cart track ran from the oast through the adjoining hop garden which was next to what is now Nightingale Lane. Hops were also grown on North Field, as it is still called and is the field between the farm yard and the Ash Path, on Holt Street Farm and at Mount Ephraim, which is to the north of St. Alban’s Court house, whilst Old Court Farm, once part of the St. Alban’s estate and now in Aylesham parish, had a large hop garden between Old Court Wood and Bonnington Farm. The Poor House records list purchases of hops and malt from Stephen Pain of Esole Street, maltster, so beer must have been brewed on the premises there for consumption by the poor of the parish. Large quantities of hop pockets (sacks) were manufactured in the 1820’s by the Poorhouses inmates which would have had a ready local market. The places of birth of the pickers shows the itinerant nature of seasonal labour at the time, the workers went where the work was and there ability to do so was greatly aided by the railways. The old malt house building in Easole is now the only surviving one of its type in the parish but over the centuries there were others. Documents from 1700 mention a toft, the previous or abandoned site of a house or building, of land of eight and a half acres which was part in Nonington and part in Barson (Barfreston) parish where a malt house had previously stood. This was near the mill site at Barfreston cross-roads. The Easole malt house is the last building at the St. Alban’s end of Easole on the Sandwich road and is easily recognisable as the thatched building with its date of construction, 1704, painted on its gable-end. Malting on a small scale for private use continued here until comparatively recently. The malt house was built on land belonging to Eaststoole Farm, purchased by William Hammond in 1699. “Messuage or tenement called Eaststoole together with one maulthouse (lately erected ) 1 millhouse (not a wind mill but a grinding mill to process the malt for brewing and probably built at the same time as the malt house), 1 barn, 1 stable with the outhouses &c. 1 orchard, 1 garden and 7 pieces of land arable & pasture thereto belonging containing by estimation 30 acres in the parish of Nonington in the occupation of said Wm. Hammond & of Thomas Duning and Henry Hopper which said messuage land & pres said W.H. (with other lands) lately purchased of Thomas Sceelles senr. & Thom. Seelles junr”. Later in the 1700’s men of the Hammond family made some financially beneficial marriages and the family’s financial problems were resolved and East Stoole remained in their possession. In October of 1808 the ; “Messuage and land contg 24 acres also in Easole Street formerly in occ of Anthony Hammond and Augustine Paine and afterwards of Richard Downing” was leased for one year. The land continued to be leased by the Paine family who became well-to-do millers and maltsters in Nonington, until the business was taken over by John Harvey, a nephew, in the 1870’s and was renamed John Harvey and Brothers, and then John Harvey & Co. The milling ceased in 1905 when the Easole pug mill was demolished [see Esole Pug Mill] and malting continued into the mid-1900’s. 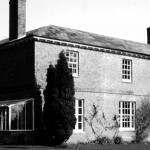 The old farm house, barn with adjoining land and malt house were bought by John Harvey & Co. when the St. Alban’s estate was sold off in 1938. Various buildings erected for use by the seed and grain business which continued in use until Harvey’s was taken over by Paul’s Agricultural [now BOCM Pauls] and then closed in the late 1980’s. The industrial buildings now house various small businesses.